Named after the Swiss canton Ticino, this European style villa of 650m² is characterised by a unique architectural blend of hand beaten face bricks, light sand coloured floor tiles and spacious, open-plan design with different height variations, with nearly four meter high wooden ceilings. Due to this impressive structure (which is impossible to capture on photos), it was possible to create useful corners and homely niches to place comfortable seating throughout the guest areas enabling different groups to get together enjoying their quality time in privacy. European style fused with Mediterranean flair and African touches lend the guesthouse its own personal, invitingly relaxed but elegant ambience. This is further enhanced by tasteful décor, lighting effects and volume encompassing a 3-dimensional look. The establishment is well designed with attention to detail and for the well-being and great comfort with all our guests in mind. Our guest house is heated during the winter months. For the comfort and wellbeing of all our guests we regret, no smoking indoors. When entering the property, a winding walkway leads past lush greenery and decorative objects up to the spacious European style villa situated on a slope. Here guests are personally welcomed by the new team, who have been run Villa Ticino with pride, passion and dedication. The entrance area is reminiscent of a typical Ticino country village scene with fountain, statues, benches and murals. From the front door the eye is led through the hall from the welcome sign to the staircase, leading upwards into our guesthouse that is full of character. A staircase directs the way up to the attractive split-level guest lounge with an open fireplace, snooker table as well as a small library with books and magazines. The mood of this space is rather a soothing, homely and calm effect due to the high wooden ceilings and the wide open-plan design. Comfortable upholstered settees and chairs invite to linger and relax. During winter the fascinating display of flames in the open fire place extends a cosy warming atmosphere. At the breakfast room one immediately observes the open spaciousness of the room, the light walls, the separately arranged tables and the impressive wall mural. The lovingly selected and arranged details enliven the Ticino country style with a decorative thatch roof and an illuminated divider. The breakfast room is of course heated during winter for the comfort of our house guests. Nestling in a nook is our cosy house bar with a snugly rustic feel. Resident guests may enjoy a drink or may interact with fellow guests. Situated nearby is our information corner with the display of menus and other information about South Africa as well as comfortable seating. The wind sheltered, generous, covered, 60 square metre terrace has beautiful vistas over the green tree tops into the mountains behind. Weather permitting; breakfast will be served here on separate tables with comfortable chairs accompanied by chirping birds. 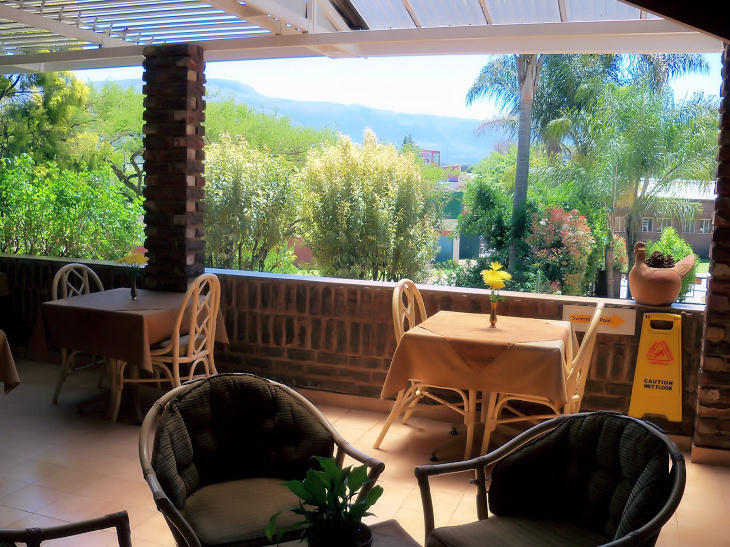 The pleasantly decorated terrace with seating is also a popular meeting point amonst guests for sundowners before heading to one of the nearby restaurants. The garden has been transformed and enhanced to include ornamental vases, a water fountain, birdbaths and statues and presents itself with a European, indigenous and tropical mixture. Since then a variety of different birds have found a home here and can be watched at up close. Every guest room has one parking bay at its disposal allocated at the fenced in parking area which is locked during night. From the lapa the eye wanders past two restaurants (10 & 30 meters) via the Sabie valley down to the gorge and to the afforested mountains beyond. From the swimming pool the distant view is onto Mauchsberg being the second highest mountain of the Mpumalanga Drakensberg range. Allow yourself a couple of recreational hours with a book or magazine at the secluded swimming pool with deck-chairs and seats, surrounded by leafy greenery or just enjoy a refreshing dip after a day of sightseeing or activities. Swimming towels are also provided from Villa Ticino. 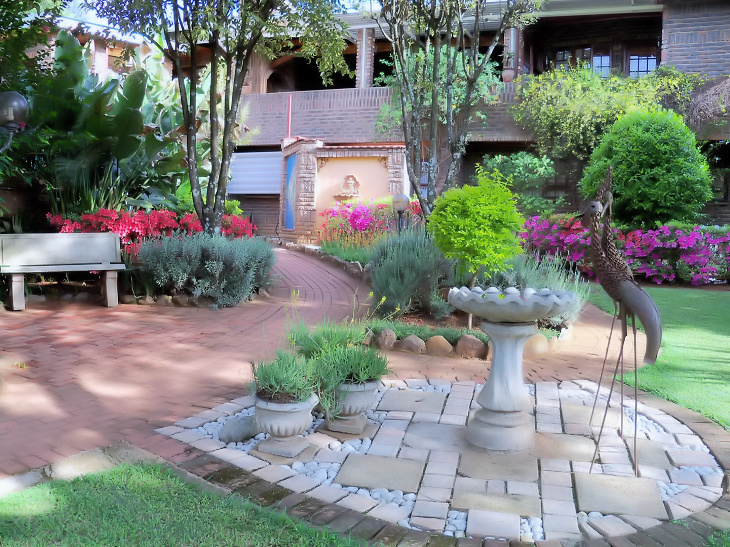 Situated in the centre of the picturesque, malaria free mountain village of Sabie is our well established guest house Villa Ticino within a short walk between 10 and 100 meters to shops and nice restaurants where you can spoil your taste buds. It is also the most central starting point to the numerous key attractions (for more info see sightseeing day tours) in the area and a mere 40 minutes drive to the Kruger National Park. The Johannesburg International Airport is approximately 4 hours easy drive from Sabie and KMIA (Kruger Mpumalanga International Airport) one hour.